James White is credited in the book's copyright page. Thanks for the post on Quakebook. We worked really hard to make it worth reading, worth cherishing. I downloaded and read Quakebook (my first ever Kindle book, which I read on my computer), and I'm glad I did! I recommend it for several reasons. First and foremost, the money spent on the book goes directly to the Red Cross to help the victims. This alone should be reason enough to buy it, even if it were blank. Second, the stories paint a raw and accurate picture of the event. As a resident of Tokyo who was here on March 11th (still here), I was struck by how closely the experiences, thoughts and emotions of others in this book mirrored my own. I can personally relate to many fragments of this book and I know I'll be coming back to these stories in the future to see how my perspective has changed. I'm curious to see how well the book resonates with readers further removed from the event. Third, although some of the entries are a little rough around the edges (and a few are actually irritating), there are some memorable gems. My favorites include the brief description of how "comfort women" in South Korea reacted, the report from a guy listening to ironic music in a Koenji basement bar while aftershocks rattle the place and clouds of radioactive doubt hang over the city, the experience of a married couple living in a high-rise apartment in Tokyo, and the awesome piece by William Gibson, which somehow gave me cheer. Kudos to everyone who donated their time and energy to make this important book possible! I know I will be very unpopular with how many people enjoy this image, but I would like to share the reactions of Japanese citizens and villagers I have shown this to. Many older people who viewed this image became very emotional when they saw it. Many were indignant. 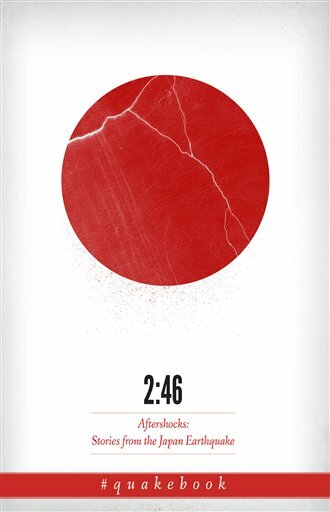 Already their confidence and sense of security is shaken, but this graphic designer has taken it upon himself to create an image that basically depicts a Japan that is broken. Yes, the image creates a sense of sympathy for potential donators to our situation, but at the cost of Japanese identity and dignity. I am reminded of the Japanese artist who designed a tattered American flag after 9-11 as an international gesture of compassion. He was stoned into producing an apology for disrespecting a country in grief. No such consideration was taken in the creation of this image. I wont attempt to justify the image but I would like to know who the Japanese artist is that you mention. I did a search for him/her but just found the same comment you seem to have 'trolled' on other sites. By the way Quakebook have a different image on the Japanese version. I suggest you show Japanese people that so as not to make them upset. Good call on 'Yoshiko' the copy/paste troll. Even if there is some validity to her criticism of the cover design, it seems overcooked and misguided in this context. Just goes to show that some people will complain about ANYTHING if given the opportunity. @Ed: I guess posting on a total of two sites (from what I could Google) means that her point must be invalid because she's a "troll." Congratulations on becoming a troll yourself by twisting the facts around in order to "not" justify the image. @Sim: You what's even worse? People who complain against complainers and toady up to real trolls. @ErnieBird: Sorry, but copying negative comments and pasting them on other blogs out of context is, in my book, troll-like behavior. Even if the point is valid (I personally agree with much of the criticism), the comment smells trollish. In any case, we here in Japan can't afford the luxury to sit back and complain about things out of context. But if you have something positive to offer, we are all ears. By the way this book is awesome, regardless of the cover! A quakebook?pretty good idea atleast the next generation of japan(or the whole world maybe) will know what happened in past and be more prepared. Congratulations on a great effort pulled together in a very short time. I see absolutely nothing wrong with the cover image. To my eye it quite rightly illustrates a Japan that is somewhat cracked and dusty following a massive seismic event, not broken at all.